Former L.A. 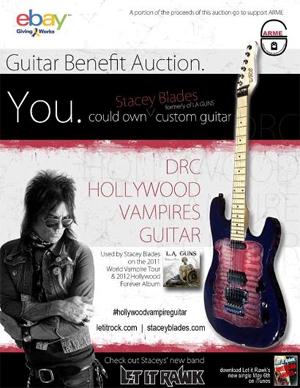 GUNS guitarist and founder of LET IT RAWK Stacey Blades, in conjunction with eBay Giving Works, is auctioning off his very own DRC Custom Shop Hollywood Vampires Guitar. A portion of the proceeds will go to benefit ARME Animal Rescue. Designed exclusively for and used by Stacey Blades during the 2011 L.A. GUNS World Vampire tour, this David Ryan Custom Shop guitar was modeled after the band’s 1991 gold album Hollywood Vampires, featuring signature color purple and Hollywood Vampires motif. DRC added an aged look to the guitar, giving it that coffin look. If that isn’t enough history, this guitar was also used on the L.A. GUNS 2012 release Hollywood Forever, produced by the late, great, Andy Johns. The guitar can be seen on the 2012 M3 Festival Concert HDTV Series and L.A. GUNS DVD, The Making Of Hollywood Forever. This guitar features a 22-fret maple fingerboard, basswood body, Seymour Duncan Invader Humbucker pickup, Curtis Novak Custom wound single coil neck pickup and Licensed Floyd Rose Tremolo System, Volume and Tone knob and 3-Way Selector Switch. “The guitar has a great tone but also has one of the sweetest blues tones out there! From driving crunch to clean driven blues this guitar delivers,” says Stacey. The winner will receive an official certificate of authenticity as well as the guitar, original hardshell case and a personalized autograph upon request. To view and/or bid on the auction, which ends May 5th, simply click HERE.